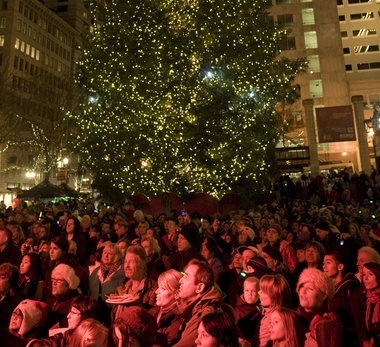 This crowd was attending a Christmas tree lighting ceremony in downtown Portland, Oregon, and it’s likely that every one of them would be dead if the anti-anti-terrorists on the left had had their way. The event was the target of a bombing plot hatched by Mohamed Mohamud, a Somali-born US citizen. After becoming radicalized, Mohamud contacted an Islamic terrorist group in Pakistan. The FBI became aware of their contacts, and contacted him, pretending to be associates of the Pakistani terrorists. The FBI gave him a nonfunctional bomb and arrested him after he tried to detonate it. We haven’t been told exactly how the FBI became aware of Mohamud’s contacts with the Pakistani terrorists (and it’s good we haven’t), but it seems likely that the government intercepted their messages. Communications such as those, between foreign terrorists and Americans, are the ones we most need to know about. They are also the ones that the left feels strongly we shouldn’t listen to. No one (well, almost no one) questions the government’s right (indeed responsibility) to capture the communications of foreign terrorists. However, many feel that whenever those terrorists receive a call from the United States, the government should stop listening until it obtains a warrant. ASIDE: As I understand it, the law provided that the government could listen to communications between foreign powers and US citizens, but a legal gray area arose because Al Qaeda is not a foreign power. The Bush Administration contended that the authorization for military force, which effectively declared war against Al Qaeda, gave the president the authority to use any means against Al Qaeda (including wiretapping) that it would use against a nation-state with whom we are at war. Fortunately, the terrorist surveillance program survived, albeit on a shorter leash. (Barack Obama voted against it 2007, but voted for it when it was renewed in 2008.) Which brings us to today. If the FBI had not learned of Mohamud’s efforts, it seems very likely he eventually would have made contact with real terrorists and probably would have succeeded in his plot. Some earnestly feel that listening to conversations between foreign terrorists and persons inside America without a warrant constitutes an unacceptable breach of our civil rights. I can respect that, although I disagree. But let’s be clear about the cost: every one of the people in that photograph. And this is just one incident. UPDATE: We’ve now seen the anti-anti-terrorists’ rebuttal. Astonishingly, they are blaming the FBI. They are saying that if the FBI hadn’t interfered, Mohamed Mohamud would have limited himself to writing angry letters to the editor or something. To summarize: Mohamud hatched the plot himself, and was only looking for a bomb to set off. The FBI tried to talk him out of it, but he was determined. This entry was posted on Sunday, November 28th, 2010 at 6:49 pm and is filed under National Security, Political. You can follow any responses to this entry through the RSS 2.0 feed. You can leave a response, or trackback from your own site.